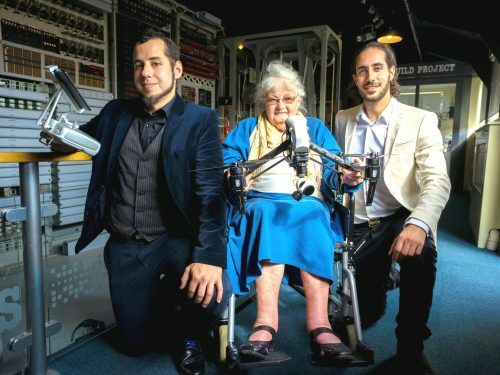 An operator of Colossus, the world’s first electronic computer, came to her wartime workplace to fly a drone in one of the many pop-up events of the Summer Bytes Festival at The National Museum of Computing on Bletchley Park this week. Just a few days short of her ninetieth birthday, Joanna Chorley returned to Block H on Bletchley Park, to operate the drone quadcopter. Through the drone’s on-board camera, she and other Summer Bytes visitors had a superb aerial view of the home of Colossus and the rest of Bletchley Park. 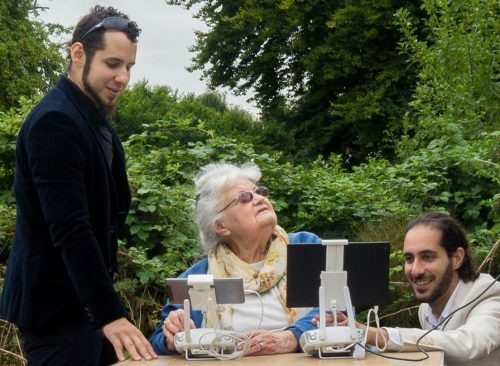 Flying at up to its legal speed limit of 50mph, and at a height of about 50 to 100 metres, the DGI Inspire drone flew over Block H relaying HD views of Bletchley Park and its surrounds via a large screen monitor to Summer Bytes visitors on the ground. Afterwards, visitors could also see how much commercial aviation has changed in the recently opened NATS Air Traffic Control Gallery in the museum. stabilises using a visual positioning system, sonor, accelerometer and magnometer.